External similarity with the iPhone 6 Plus. The main and front cameras are 16 MP. Fingerprint scanner. Quick charge up to 70% in 30 minutes. A version with 128 GB storage is available. Combined slot for the second SIM-card and microSD. The senior model of the flagship line of ultra-thin metal smartphones from the Chinese brand. Compared to the model without the "Plus" prefix, the diagonal of the screen has grown to 6 ". Also slightly changed the "hardware" - the processor is Snapdragon 652. The amount of RAM remained the same - 4 GB, but there were modifications with a storage of 64 and 128 GB. As for the cameras, the frontal did not change, it's the same advanced module at 16 MP, but the main one was pulled up to the level of the "front" with a matrix of the same resolution and phase autofocus. 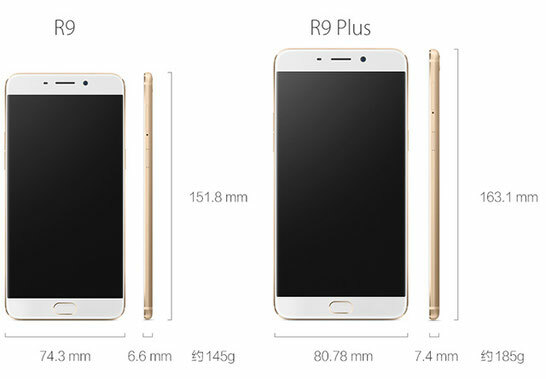 Also improvements have touched on communications, the OPPO R9 Plus smartphone supports Wi-Fi 802.11ac and Bluetooth 4.1. For its modest dimensions and weight, the gadget received a battery of rather high capacity - 4120 mAh.